Starting Gate Nutriotional Granules 18.75 lbs (5 Gallon) (105 Day Supply) (SBS Equine) Help Reverse/Prevent Equine Gastric Ulcers and Improve Hoof Growth by Strengthing the Epithelial Tissues that line the GI Tract and Coronary Band. It works on a cellular level to strengthen the epithelial tissue that lines the gastro intestinal tract. New Size 4 - 1.1 Gallon Jugs(Sold only as a case of 4) See Item # SBS0330 - $278.00, Includes Free Shipping, easy to travel with you and stays fresh longer. Starting Gate is Human grade is labeled for people and their horses that want to function better(e.g. race, play) and live longer.It is a highly concentrated form of mixed phospholipids which is a natural food additive. It is recognized safe by the FDA, European Union and the World Health Organization. Kosher and Halal approved. Starting Gate is less expensive than acid blockers that can disrupt the normal digestive process by not allowing food to breakdown properly. 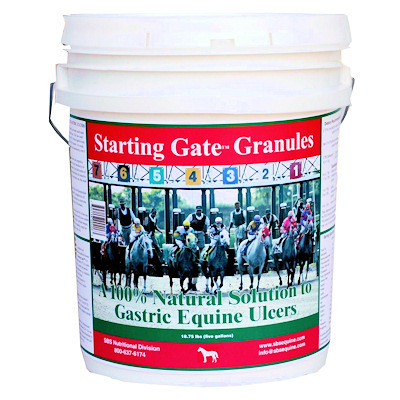 Click here to read an article about Starting Gate Nutritional Granules.